"I am saddened to report that Grandpianoman passed away on 10/18/2016 after a courageous fight with cancer. He was only 66. I never had the opportunity to meet him in person, but we enjoyed many years of correspondence and phone conversations discussing our mutual interest in player pianos, reproducing rolls, etc. He was not only a world-class performer in his professional life but also a generous and gracious piano enthusiast, as many of you know from his prolific posting history here on PW. He will be missed." That's right, there is a new Piano World coming soon to a browser near you. We've been working hard on a complete redesign of the main Piano World we site, long overdue. The new site is streamlined, easier to navigate, and device responsive, meaning it automatically adjusts itself for the type of device you are using to access the site (desktop computer, tablet, cell phone, etc.). Along with the new design we will be rolling out new features and of course adding new content. Keeping in mind it's still a work in process, we'd love to get your feedback on the new design. You can preview it here... wp.pianoworld.com (the wp prefix will be going away when we launch live to the world). So What Are The Topics? The following are examples of the Topics being discussed from the last 24 hours (as of 11:00 a.m. EST on 24 October 2016). This is in an old farm house left to the elements near where I live. It is a fine piano and should last well beyond 20 years with regular maintenance. Originally Posted By TimROh, and I would "reframe" this whole discussion. Rather than a student who plays without emotion, I would describe a student who plays without dynamics. One is teachable, the other not so much. +1 ! The Scarlett 2i2 has not many inputs : 2 (you can record yourself in stereo). The advantage compared to a low-cost soundcard will be the sound quality. It is up to you to decide if the Focusrite 2i2 is worth the extra cost. Adypiano, Nice esthetic web page. Do you do your own case polishing? How do you get that crisp paper thin look? 50 coats of shellac ? Reading without playing at the same time is pretty useless unless you can hear the music in your head. Re: Yamaha CP60/70/80 M - how does the midi work by Morodiene @ October 24, 2016 10:27 AM Originally Posted By Frederic LOn the CP60M manual I read : Note On : 90h v = 1-127... I think it send a velocity number. There you have it: it will give a range of velocities and not just on/off. Piano Parties! We love piano parties! If you are planning to hold one, please let us know. Piano parties are a great way to share your love of playing (and listening) and an opportunity to get non-players or used-to-play people interested. New Piano Lamps in Our Online Store! PianoSupplies.com is a division of Piano World. We now offer the beautifully crafted Cocoweb piano lamps. They have been designing lighting products for over 50 years, using a team of talented in-house professional designers. We are pleased to be able to offer you these superior lighting solutions for your piano, music room, home. When Is a Piano Not a Piano?? When it's a piano with a PianoDisc ProRecord QuietTime system installed! What a Performance! Using amazing technology it captures every nuance of your playing using a super sensitive optical sensor system that measures the exact position of the key (it captures 1024 levels of expression for each note without adding delays or reducing velocity accuracy). It's not recording the sound, it's capturing your performance. But what's more exciting is what it can do with it! Silent Play - Play Your Acoustic Piano Through Headphones - with the QuietTime you can play your acoustic piano anytime without disturbing anyone else, listening through headphones. Yes, that's right. Your acoustic piano will be silent to others while you play and listen through headphones. I'm a Composer - Send your performance out with the built in MIDI system to your computer/laptop and using a program like Notation software what you play can be automatically converted to sheet music. I like to compose, but I'm weak on theory and have no patience. This is the perfect answer for anyone who loves to create but doesn't like the tediousness of writing it all down note for note. I'm Hearing Voices! - Yes you are, if you have the ProRecord system installed in your piano. 88 of them to be exact. That's right, now you can make your acoustic piano sound like a pipe organ, strings, digital pianos, vibes, even choral voices, and so much more. But it doesn't end there! There are new and updated voices in the works (including one being produced by one of our forums members). It's a MIDI Controller, It's an Acoustic Piano! The ProRecord system turns your acoustic piano into a midi controller. Now you get the best of both worlds! That's right, it can turn virtually any acoustic piano into a midi controller, all while capturing every nuance of your performance. You can use your iPhone or iPad to control the ProRecord sytem. Don't own an i-products? You can also access the controls with a Windows based system using the built in USB port. And I expect the launch of our newly designed site will increase our presence on the Web by making Piano World available to all types of devices, a growing requirement of the major search engines. Congratulations to member Wolfgangmeister (aka Jason Solomindes). Jason has just been designated a Mason & Hamlin Artist. There were some grumbling on the forums a while ago that Jason was posting a lot of positive information about M&H and that he should reveal his industry affiliation. At that time, he had zero affiliation other than being a big fan and owner of a M&H piano. It doesn't hurt that he is a concert pianist by choice (he went to school with our own Jeffrey Biegel, they are good friends), but you should know he is a successful engineer by trade, working as Chief of Controls for a very large jet engine manufacturer. So no, he is not a shill for M&H and receives no money from them. I've had the pleasure of meeting him in person a few times now, he is a gentleman and a talented musician who happens to be very enthusiastic supporter of M&H, and thankfully of Piano World. I'm also happy to note that we count among our forums members a number of concert artists associated with other major piano manufacturers. We can even count among our membership a concert artist who owns a piano company (Dr. Indrek Laul, owner of Estonia Pianos). I sometimes post pictures and blurbs about my tuning adventures on the forums, other times I only get them up on Facebook. A big thank you to all the wonderful people who have made a donation and/or become a subscribing member of our forums. Keeping Piano World and the Piano Forums going is a challenge. I get up every day thinking I need to find a way to generate income. I know it's my choice to be self-employed and I love it, but there are times when it can be a bit intimidating. The support of our advertisers and sales in our online store is how I keep Piano World going and how I support my family (along with some piano tunings). Being self-employed is not easy and business has been tough lately. Please consider purchasing from our online store, or if you are professional in the piano industry, advertising on the world's most popular piano site, Piano World. If you you'd like to show your support some other way, please visit our Support page. Keep in mind one of the best ways you can help is to spread the word about Piano World and the Piano Forums. Tell your friends, co-workers, relatives, etc. And especially suggest to piano related businesses (teachers, tuners, movers, dealers/stores, etc.) that they should be advertising on the worlds's most popular piano site! Robin Meloy Goldsby - The Piano Girl! That's right, our very own Piano Girl is coming to the States! If you don't know Robin, you should. She is a multi-talented musician, composer, author, and story teller. The University of Northern Iowa School of Music is thrilled to announce the 2016 Midwest International Piano Competition, taking place in Cedar Falls, Iowa, June 5-11. Here in the north winter is fast approaching, we've already had nights in the 20s (Fahrenheit). On goes the heat, and down goes the humidity in your house, often WAY down. 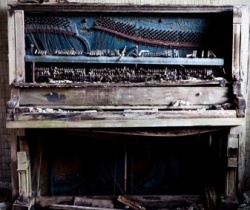 This is bad for you as a human, and bad for your poor piano. In fact many manufacturers of high end pianos have a clause in their warranty that states that you must maintain a certain level of humidity in the environment around the piano, or chance voiding your warranty! Why Does My House Get So Dry? In winter, your furnace heats the air in your house and, by doing so, lowers its relative humidity. That makes the air dry. Explanation of the term relative humidity. Relative Humidity (RH) indicates the amount of water vapor, in percent, actually in the air compared to the maximum amount that the air could hold under the same conditions. The warmer the air, the more moisture it can hold. Air in the home heated to 70° F can hold about eight grains of moisture per cubic foot. That is 100% RH. If there are only two grains per cubic foot in the home, this is 1/4 of the air capacity or 25% RH. So, what happens to the air when it's heated? Your furnace will bring in outdoor air to be heated. During the winter months it's very common to find outdoor RH at 70% and air temperature at +10° F. When this air is heated to 70° F, the indoor RH drops to 6%, this is similar dryness to desert conditions. The only solution is to add water vapor to the air - humidification. A whole house humidifier would be ideal for you and your piano, but if your house isn't already equipped it can get pretty expensive really fast. Next would be a full room humidifier. If neither of these is practical, ask your piano tuner-technician about a system made specifically for your piano. The Dampp Chaser / Piano Life Saver is one such system (there are other). Be sure your piano tech is experienced in determining exactly what your specific instrument needs, and that he/she is qualified to install the system. By the way, for those of you are coming into your summer season (or tropical areas) the problem is the opposite where you can have too much moisture in the area, also bad for your piano (the issue we have up here in the summer). Again you can control the situation either whole house, one room, or with the help of your piano tuner-technician within the piano itself. The systems installed in the piano are also helpful in places like churches and schools where it's even less likely that the room/building will be controlled. As a piano tuner I sometimes receive calls from customers who tell me they aren't sure if their piano actually needs to be tuned. Let's think about this. Have you ever watched a violinist in an orchestra? They often tune up before every piece, and they only have four strings to contend with. The average piano has about 235 strings with a total tension (pull from all the strings) measured in tons! And how do you make music on a piano? By whacking those strings with felt wrapped devices called hammers! 85,000+ Forums Members, Over 2.5 Million Posts, and always growing!